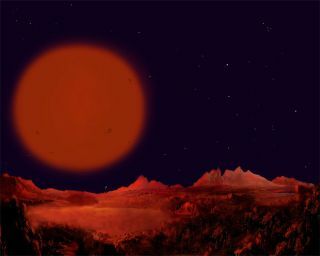 Artist impression of the view from the surface of a rocky planet in orbit around a red dwarf. For more than 200 years, astronomers thought that most of the stars in our galaxy had stellar companions. But a new study suggests the bulk of them are born alone and never have stellar company. Since planets are believed to be easier to form around single stars, the discovery could mean planets are more common as well. Conventional wisdom on double star systems, called binaries, goes as far back as the late 1700s. More sophisticated observations made in the 20th century seemed to confirm the numerical dominance of pairs. Stellar surveys found that more than half of all Sun-like stars were part of multiple systems. For more massive stars, like O- and B-type stars, the number was estimated to be as high as 80 percent. A few stars, like the North Star, Polaris, have two or more companions. "If you go out and look at the all visible stars in the night sky and ask, 'How many of those are binary?' the answer is, 'Most of them,'" said study author Charles Lada of the Harvard-Smithsonian Center for Astrophysics (CfA). "The assumption was that because most bright stars were binaries, all stars would tend to be binaries." The catch, however, is that most stars in the Milky Way are not bright stars like our Sun, but dim, low-mass stars called red dwarfs. Scientists estimate that red dwarfs make up to 85 percent of the stars in our Galaxy. These stars are about one-fifth as massive as the Sun and up to 50 times fainter. Red dwarfs are so dim that it's only been in the past decade or so that technology has improved to the point where astronomers can study them in detail. And they've found that only about 25 percent of red dwarfs have stellar companions. Lada concludes that upwards of two-thirds of all star systems in the galaxy are single, red dwarf stars. His finding, announced today, was detailed in a recent online edition of Astrophysical Journal Letters. "It's an important realization," said Christopher McKee, an astronomer from the University of California, Berkeley who was not involved in the study. "The facts that [Lada] points out were available for a long time and people just hadn't put them together." The skew towards singleness only applies to red dwarfs, however. It's still true that more than half of the brighter, more massive stars in the galaxy have companions. Recent observations show that half a dozen new stars are produced each year in the Milky Way, but many of the details surrounding their births remain unclear. According to the classical theory, stars form when large clouds of dust and gas in space collapse under the force of gravity. If these dense cores of matter reach a critical limit, internal nuclear fires ignite and new stars are born. However, this theory doesn't explain why most large stars tend to have companions. "There are theories that can form binary stars and theories that can form single stars, but there none that explain why you form more singles than binaries," Lada told SPACE.com. Astronomers have some ideas though. Observations have shown that the large clouds that serve as stellar nurseries for massive stars are more turbulent than small clouds where red dwarfs are thought to typically come from. It could be that this turbulence causes massive stars to form in groups of two or more. "If the [large clouds] have some initial turbulent motions, then as they collapse, they will tend to split up," Lada explained. Lada's finding could be good news for planet-hunters. Although some studies suggest that planet formation around binary star systems is more common than previously thought, most astronomers believe that making planets is still easier around single stars. It's thought that when there are two or more stars, the gravitational forces between them hinder matter from clumping into cores dense enough to form planets. If single stars are the rule and not the exception, as the new finding suggests, then extrasolar planets may be more common as well. "Red dwarfs may be a fertile new hunting ground for finding planets, including ones similar in mass to the Earth," Lada said. One such planet may have already been found. Astronomers recently discovered a cold, rocky planet that is about 5.5 times the mass of Earth around a red dwarf 28,000 light-years away.